Whether you like football or not, almost everyone is familiar with Futbol Club Barcelona. 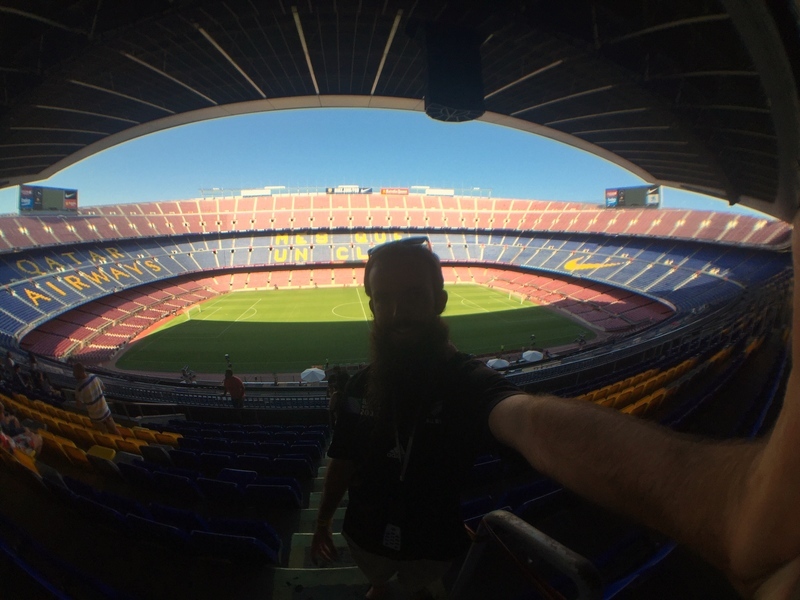 Pretty stoked to on the ground level of Camp Nou! I prefer rugby over football. But visiting Camp Nou, the stadium, and home of FC Barcelona? That’s exciting. Why do people all over the world choose to support Barcelona Football? 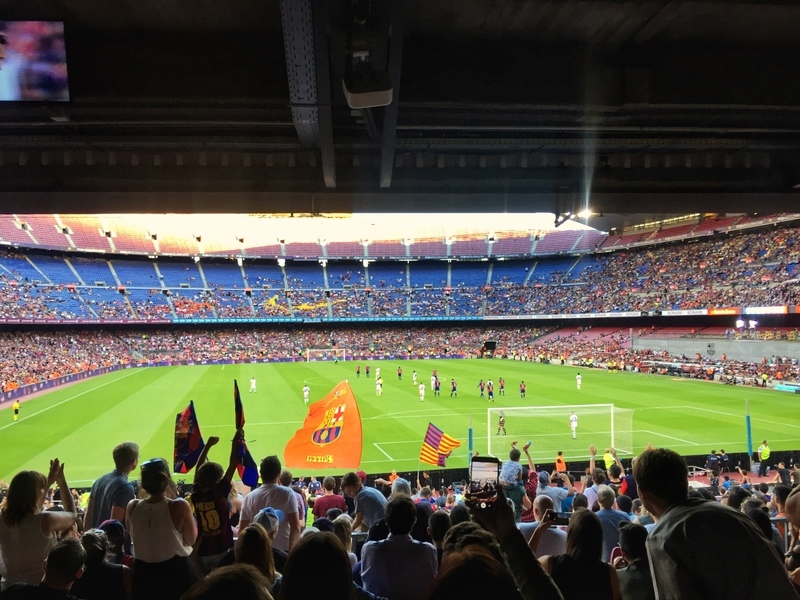 How does football fit into the culture of Barcelona? 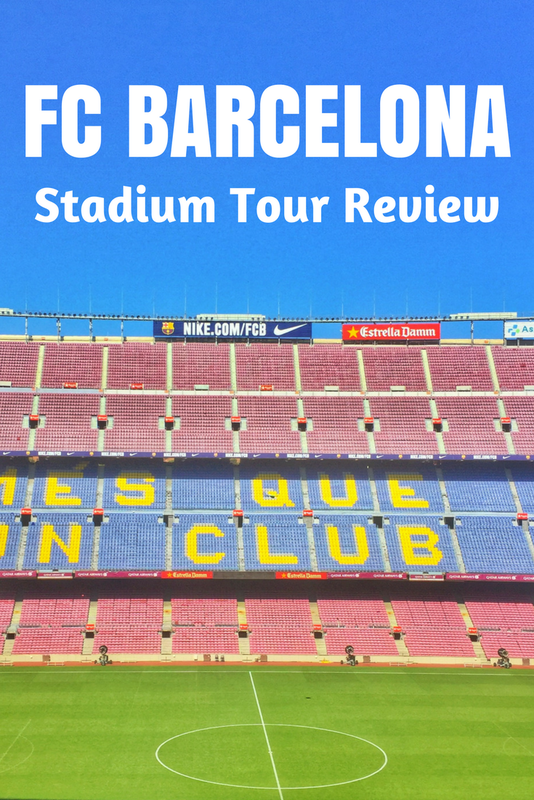 There are three sections in this Camp Nou tour review. My experience at the stadium, an FAQ and my answers to the questions above. 3.1 What Is The Best Time Of The Day For The Camp Nou Experience? 3.2 Can You Eat At The Stadium? 3.3 Is There A Camp Nou Tour Promotional Code? 3.4 Should I Get The Audio Tour? 3.5 Can I Still Visit If It’s Raining? 3.6 Where To Stay Near Camp Nou Stadium? 3.7 How Long Does The Tour Take? 3.8 When Is Camp Nou Open? 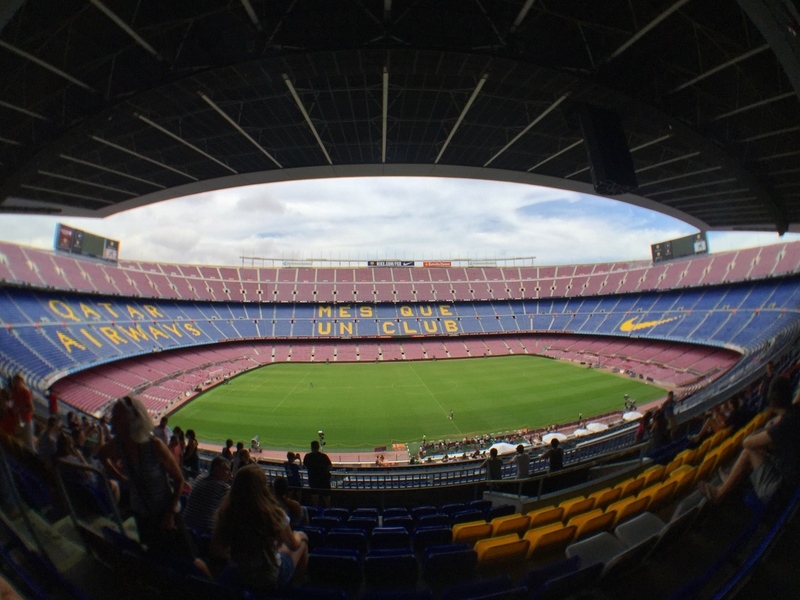 3.10 On A Scale Of 1 to 10 Is The Camp Nou Experience Worth It? I knew the tour was popular, but even on a midday afternoon you could have placed me in the middle of La Rambla and I’d believe you. She was crazy busy. Thankfully people book tickets online, so the queue for tickets was short. Passing through the gate, I picked up the audio tour for €5. In general audio guides are a good value decision. 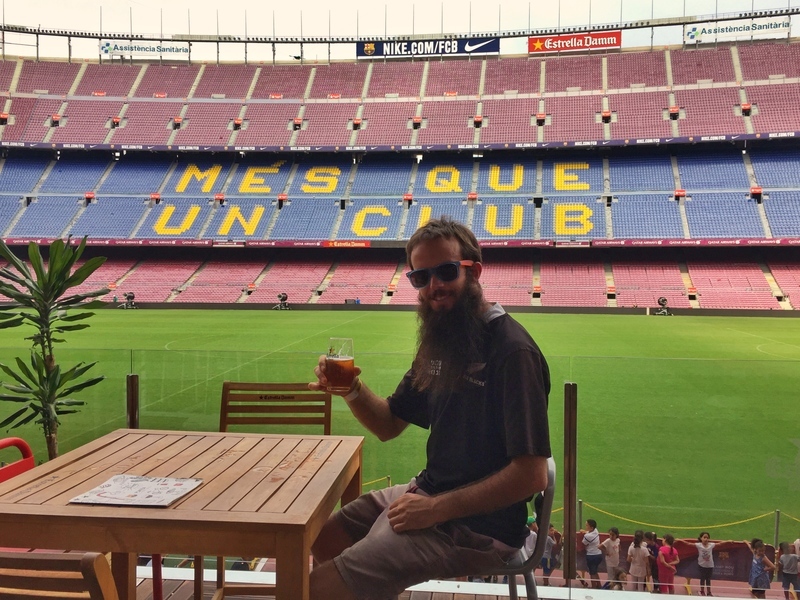 I’ve had guides when visiting Denver’s Mile High Stadium and Melbourne’s MCG and they made the experience 23x better through their epic storytelling. 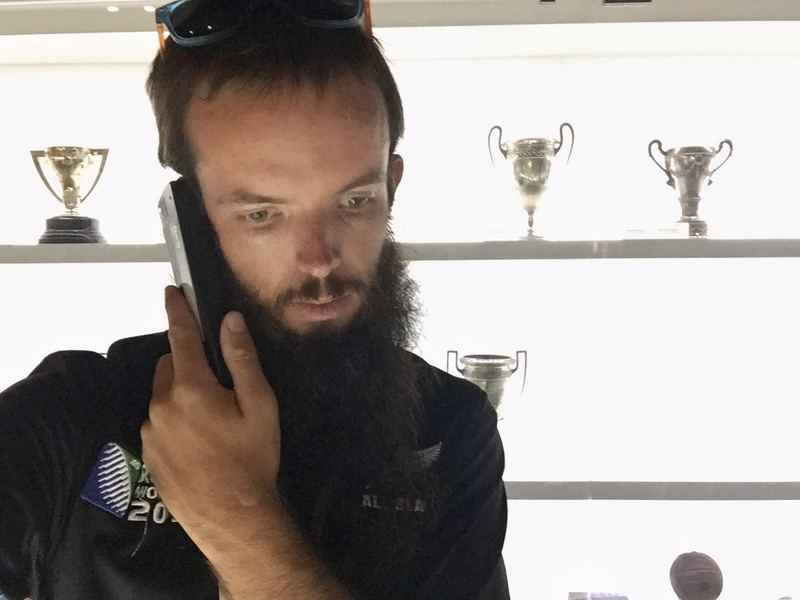 Any how after a few cash cow photo ops (no obligation to buy), I started the tour in the museum. Wow, the place was chaotic. With so many people and lots to see I was flustered. After doing a walk through I figured out how the audio guide worked. The little microphone signs were camouflaged on the tables (a minor inconvenience). The first thing I noticed when entering (besides the crowd) was the trophies. So many trophies! They’ve been a club striving for excellence from the start that’s for sure. 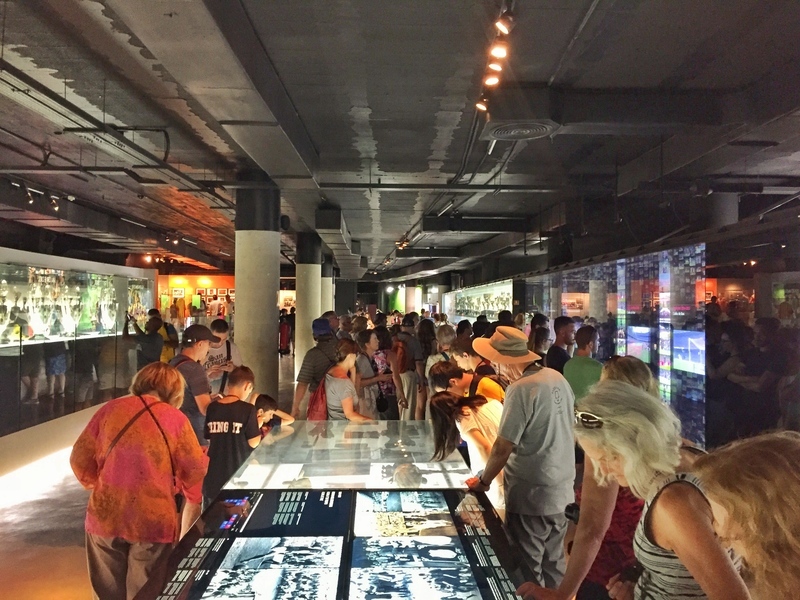 The audio tour starts off by following the eight or so large tables featuring photos and text (in English, Spanish and Catalonian) highlighting special moments from the clubs history. The audio guide is like a concise version of the important parts of each decade (there is a lot of text on the tables). You’ll also seem some cool bits and pieces of memorabilia at the end of each table. READY TO VISIT? BOOK YOUR CAMP NOU TICKETS TODAY. There is a big interactive screen where you can play around with different sections and highlights from the club. I didn’t spend any time here, there was always a tonne of people. After you’ve learned all about the history, the next stage has yet more trophies from both football and other sports the club represents like hockey and basketball. There are also some other bits and pieces, jerseys and large photos of legendary Barca teams. Then you get to Messi. He may well be Argentinian but Barcelona have well and truly adopted him. You can see what I believe are replicas of his personal trophies he continues to collect in a dedicated corner. A nice touch! 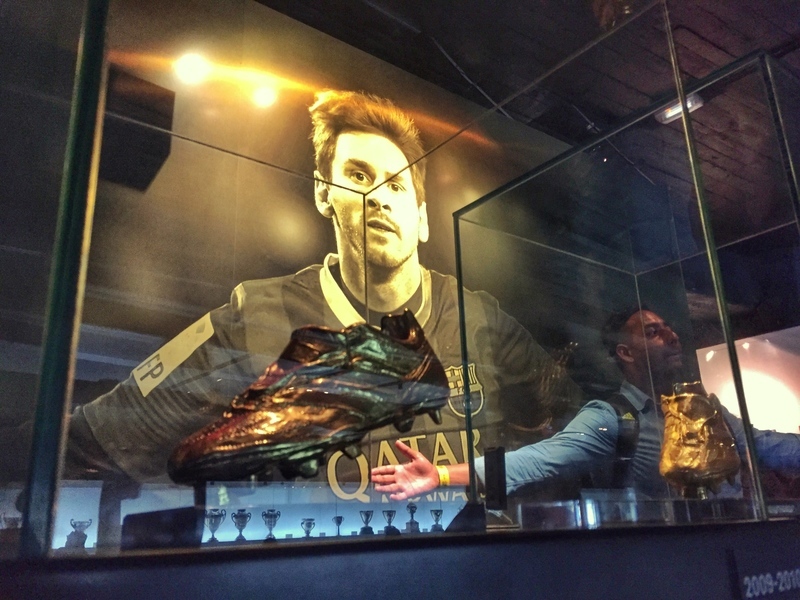 A wicked image of Messi, replica golden boot in the front. Can you see the tourist? I found the church so random! Guess a quick prayer before game time never hurt anyone? The great thing about the tour was not being forced through from one section to the next, you can take your time and chill. Insert cheesy quotes intended to make the hair on your arms stand up. Left: Media room, where the interviews go down. Right: Changing rooms. The media room and changing rooms are cool to see, but you only need to take a quick photo out of obligation. These are two areas where guides are great. So many great stories come from both of these places. On the halfway line, would love to be here in game! My favourite view, of course, would have to be from the sideline. Looking up at the stadium, while you can never grasp the atmosphere, you can put your imagination to good use. Also, nice branding by Nike and Qatar, I’ll always associate them with Barcelona with their large logos on the stadium seats. There is a place where you can have a bite to eat and drink just above this section too, why not prolong the view just above the playing field? The other great view is from high up in the press room. It’s always a tight squeeze up there but most seats offer an excellent view over the top of the stadium. Unfortunately, I totally forgot to use my audio guide through these sections, but again, a cost-effective guide option is perfect for these areas. The other view is immediately after coming out of the museum tour, it’s a nice spot to sit for a while in the stands. Purely by view quality, the other two are better. The colours of Barcelona are officially known as blue and claret (I associate claret with a head cut so that’s fun). Barcelona had their first star player in Paulino Alcantara (Philippines) scoring 357 goals in 357 matches (debuted in 1911-12). It was said his kick could rip the net due to its power. Swiss Hans Gamper founded the club in 1899, putting an advert in a magazine asking if people wanted to form a team. The 1968 Spanish Cup Final is known as ‘The Bottle Final’ as spectators threw bottles at Barca players near the end of the game that Barca won 1-0 over rivals Madrid. In 1973 the club reinstated their official name, Futbol Club Barcelona. Barcelona has gotten involved in the politics of Catalonia from time to time. In 1977 former club President Montal pledged support of re-establishing the Catalan government. The clubs anthem, Cant del Barça, was written by Jaume Picas and Josep M. Espinàs to celebrate the clubs 75th Anniversary. During the 1950’s, club membership numbers doubled from 26,000 to over 52,000 members. 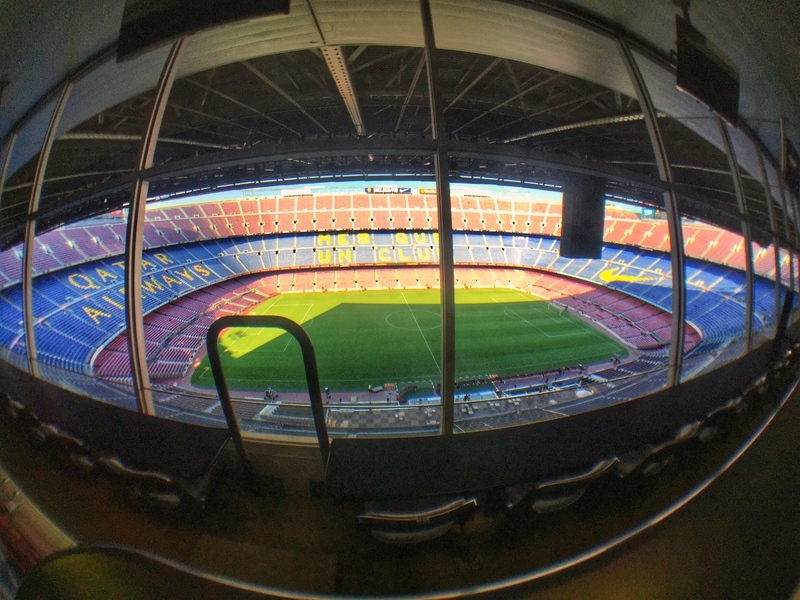 Camp Nou opened in 1957, taking three years to build. And that is just 9! You’ll learn so much on the tour. 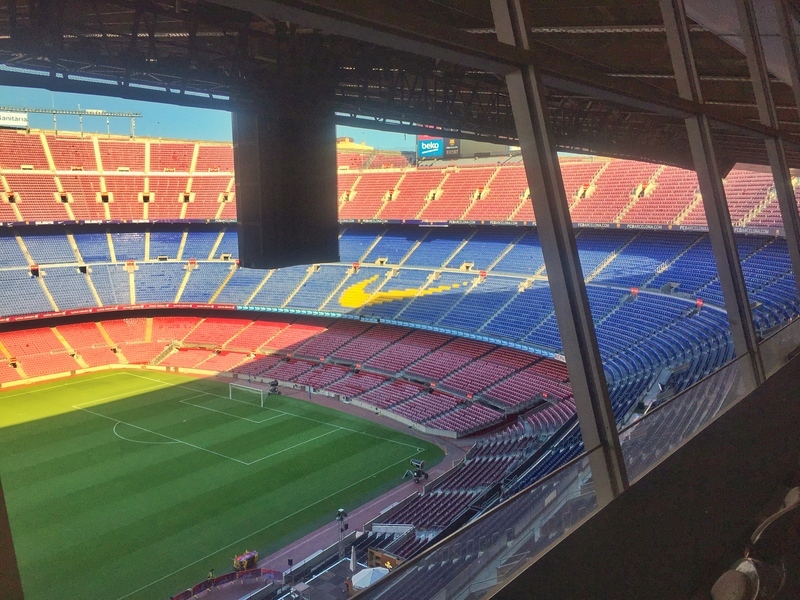 A few questions I can see being asked regularly about visitng FC Barcelona stadium. 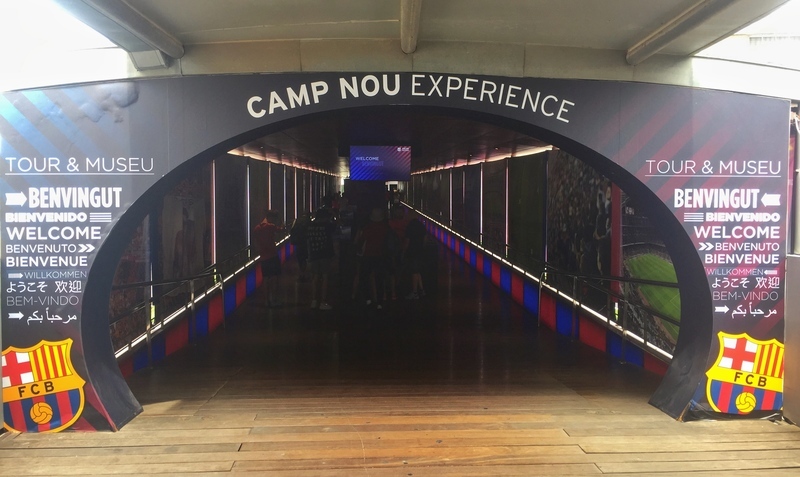 What Is The Best Time Of The Day For The Camp Nou Experience? I’m pretty sure the stadium tour is going to busy all day with school groups and large tour groups arriving throughout the day as well as other travelers. I went twice, in the mid and late afternoons and both times were busy. 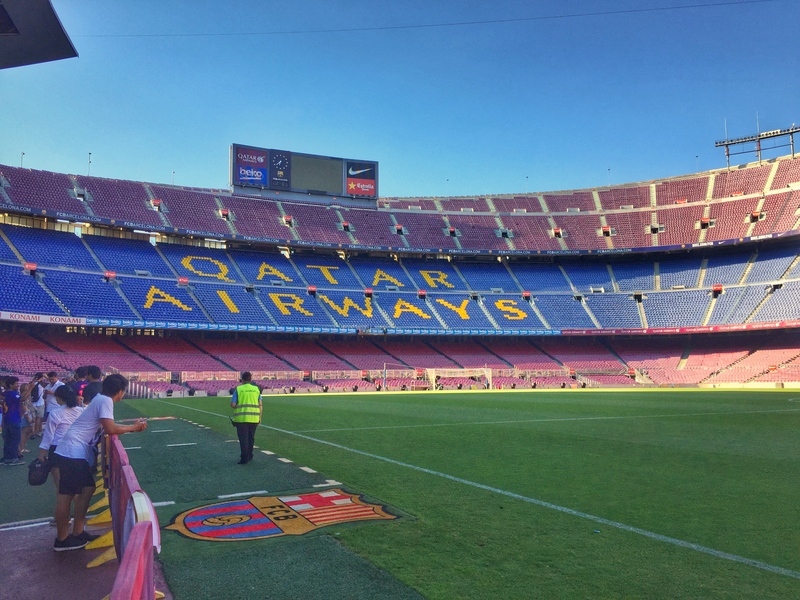 In regards to getting the best photos of Barcelona stadium, the shadows start to come over the at about 5pm (roughly), so that might play a role in your visit if you want the perfect Instagram shots. Can You Eat At The Stadium? You sure can! When you arrive, you’ll find some overpriced food truck style places. Wait until you’re actually inside the stadium and enjoy some food and a cervesa with atmosphere. The first spot you can grab a bite and a drink is overlooking the field from a courtyard like here. I grabbed a beer here for $3.50, not bad for a beer inside the stadium. Food prices seemed reasonable too. Then there is a canteen style like place that I walked through, prices seemed similar with the main attraction the video game play area. The final spot is a open plan restaurant with a couple of foosball tables near by and a big screen projector playing highlights. I’d go with option one, then three and don’t bother with the canteen style place unless you must play video games forever (be respectful of others wanting a turn). Is There A Camp Nou Tour Promotional Code? You might be able to find them cheaper somewhere, but in all likelihood they’ll be fake/dodgy. I’m not aware of any discounts so the cheapest place to get them is online. See the full pricing menu.The tickets in person are like a euro or two more expensive with the booking fee. Should I Get The Audio Tour? I enjoyed the audio tour! Yes! It’s a no brainer in my opinion. Relative to the ticket price the 5 is not much extra for adult. Can I Still Visit If It’s Raining? Sure can. 95% of the time you’ll be undercover. When you get to stand pitchside you might get a little wet, but #yolo. Bring a raincoat if you have too! Where To Stay Near Camp Nou Stadium? I was staying on the other side of town with a friend so can’t give any personal recommendations. HotelsCombined is a cool place to start searching for hotels near Camp Nou. It’ll search the popular booking websites to figure out the best price for you. As long or as short as you want. I asked the staff and they said the average is about 90 minutes. If you read everything, take photos, eat food and drink a beer you could be there for well over three hours (not a bad thing). I took about two hours each time, but was reading everything the first time and then went and took lots of photos and had a beer second time round. When Is Camp Nou Open? Check the official site for the latest viewing times (including match day opening hours), or you’ll find out when you’re booking your tickets online. Not from what I could tell. It’d be bad form to take a drone though, getting in the way of photos/narrow takeoff area. Bring along all your cameras, at worst I’m sure you can leave it at a desk somewhere. On A Scale Of 1 to 10 Is The Camp Nou Experience Worth It? The tour is busy and the lack of available private guides are definite downsides. The amount of information, great audio tours, ability to move at your own speed, reasonable food, and dining options, and the interactive spots make it a solid 8.5 out of 10. This is my first stadium tour rating, so I have nothing to gauge that against. Yet. Barcelona play in the best competitions around the world, therefore win important trophies. As they do so, people love to jump on the bandwagon of winning teams so Barcelona is who is chosen. Once you choose a team (like me and the Bulldogs), it’ll take a lot of effort for one to ever consider switching allegience. The players they’ve selected to build their club around is impressive. Messi of course has been a great player for over the last decade and is irreplaceable. Previously Ronaldinho became a club favourite. Throughout history, Barcelona have chosen players to bring to the club, who are not only can have a team built around them, but will be one of the best players in the world for the next few years, and will pay them a salary accordingly. To put it in one sentence, President Narcís de Carreras coined the phrase in 1968 ‘More than a club’. No idea how to describe this really, but incredibly! 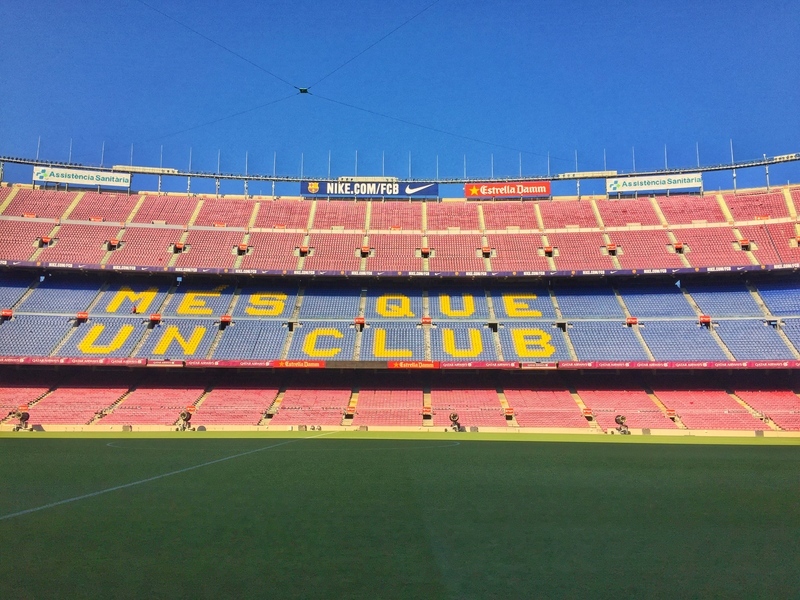 During the tour, one of the descriptions mentioned how immigrants to Barcelona latched onto supporting Barcelona FC as a way to associate themselves with the city. This is massive! When I was walking around the city, you notice Barcelona football jerseys being worn despite the offseason. The tourist shops that pop up have footy gear prominent. El Clasico, the matches against Madrid, are some of the most watched games in the world. < p>There is also the idea I’ve come up with that Barcelona represents the nation of Catalonia. Catalonia was to be recognised as a separate identity to Spain and a creating a referendum to push through the cause. It’s unlikely to ever go through due to a few reasons. This means, when Barcelona are playing, it’s essentially their national team playing and everyone gets behind their team at an international level. 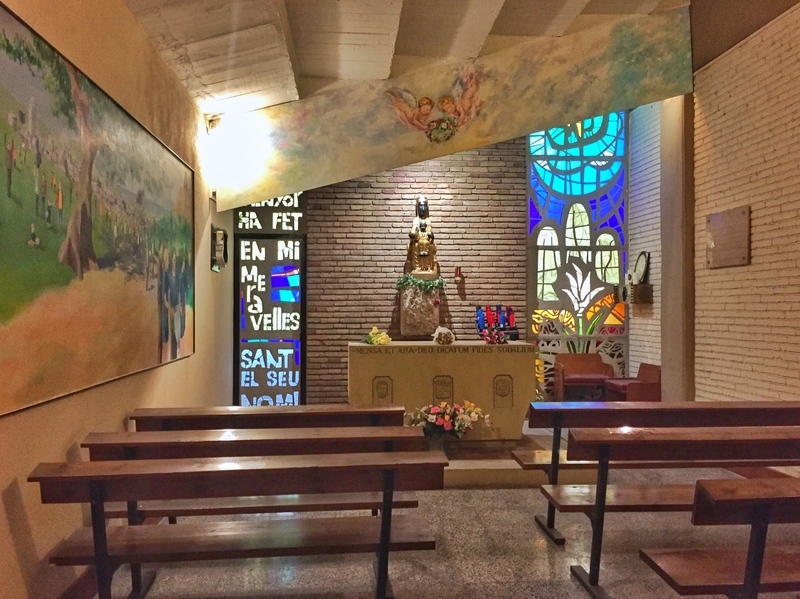 The club also became a social integration catalyst in the 1960’s when Catalonia’s population grew by 1.2 million thanks to large migration from Spain’s south. There was large migration in the 20’s with migrants from Valencia, Murcia and Aragaon and the 1990’s with immigrants from other countries. Barcelona helped unite society during these three periods of intense migration. Ultimately, if FC Barcelona wins, the whole of Barcelona wins. Thank you very much for this charming and enriching blog. I felt your experience in this charming stadium. Thanks so much! Super informative! Heading there today! How was the visit? Any info I missed or that needs to be updated? You recomend the player experience tour or the traditional or basic tour? 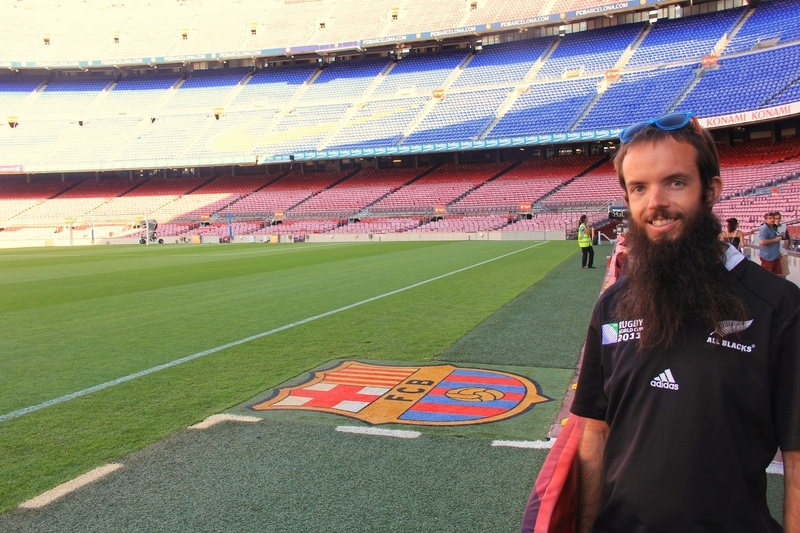 If you love FC Barcelona, I’d recommend the play experience tour. If you’re a football fan in general, the basic tour will be fine. hey, im off there tomorrow, just wondering as i’ve bought the basic tour, do you get to go on the pitchside or does that only come with the player experience tour? Apologies for not responding sooner! You do get to go pitchside right? Did you get to go on the pitch side with basic tour ticket?